Earlier today, the mayor of Las Vegas pleaded for blood donations. Some people are waiting 6 to 8 hours to donate blood at some clinics in the area, according to Steve Sisolak, Clark County Nevada Commission Chairman. "We have been deluged with donations," Sisolak said, referring to blankets, sandwiches, water and more. "It’s almost to the point we can’t handle any more donations at the convention center." A gun store in Mesquite sold firearms to the gunman who killed at least 58 people and injured more than 515, according to Guns & Guitars, Inc's general manager, Christopher M Sullivan. The shooter, 64-year-old Stephen Paddock, lived in a retirement community for people aged 55 and over in Mesquite, Nevada. 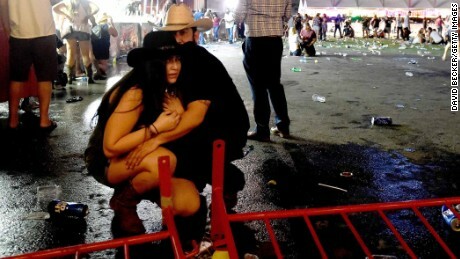 Police found 10 rifles inside Paddock's hotel room, Las Vegas Police Department Sheriff Joseph Lombardo said on Monday.